California Courts begin to Reexamine their Outdated Decisions Addressing Vertical Price and other Distribution Restraints under the Cartwright Act. California courts, of course, are free to interpret California’s antitrust statute in accordance with state policies which provide the underlying rationale for the legislation. And, there is much current debate about the effect that current federal jurisprudence does – or should – have in the interplay between California state and federal antitrust law. Dr. Miles (1911): In 1911, the Supreme Court in Dr. Miles invalidated an agreement that required a manufacturer’s dealers to comply with the manufacturer’s mandated minimum resale price.15 Finding that the practice was per se unlawful, the Court announced that the “right of alienation is one of the essential incidents of a right of general property,” and that “restraints upon alienation have been generally regarded as obnoxious to public policy.”16 Under the rule of Dr. Miles, which remained in effect until 2007,17 all agreements between a manufacturer and its retailers establishing minimum resale prices for the manufacturer’s goods were per se unlawful.18 This per se rule was premised upon the common-law rule against “restraints upon alienation,” and the then-held view – a view that today is inconsistent with generally accepted economic thought (although not universal) – that resale price maintenance had no conceivable procompetitive effects. Mailand (1978): In Mailand v. Burckle39 – a 35 year old case expressly applying the holding in Dr. Miles to its interpretation of vertical minimum resale price maintenance under the Cartwright Act – the California Supreme Court held that vertical price fixing is a per se violation of the Cartwright Act.40 Plaintiffs entered into a franchise agreement with the defendant to operate a drive-in dairy/gas station owned by defendants. The franchise agreement required plaintiffs to purchase gasoline from a specified oil company, and provided that the defendant could set the price of gasoline then sold by the plaintiffs in exchange for a guaranteed profit of 7% to the plaintiffs on the gasoline sales.41 The defendant then collected a rebate from the oil company for gasoline it sold to the plaintiffs.42 After two years of operating under the franchise agreement, the plaintiffs filed a lawsuit against the defendant, asserting claims for unlawful vertical price fixing in violation of the Cartwright Act. The defendant cross-complained for declaratory relief, seeking a determination that he had not violated the Cartwright Act.43 The trial court found that neither the franchise agreement nor the arrangement between the defendant and the oil company violated the Cartwright Act.44 The trial court found that the price fixing at issue was lawful “because defendant[’s] rents and royalties depended on the gross income and sales, the reputation of the [dairy] depended on the gasoline prices, and plaintiffs had no experience at competitive pricing.”45 An appeal ensued. But, the Spriggs decision also expressly relied on outdated and now overturned federal precedent.59 First, the Court explicitly predicated its decision on the assumption that the interpretation of the Cartwright Act is consistent with federal cases interpreting the Sherman Act.60 Second, the Court also explicitly predicated its decision on Mailand.61 Because federal jurisprudence and current economic thought now are otherwise, and because Mailand provides no precedential effect, Spriggs also has no current precedential value. Kolling (1982): In Kolling v. Dow Jones & Co.62 – a 31 year old case also applying the Colgate Doctrine to the Cartwright Act – another California appellate court, affirming a judgment following a jury trial below, held that the evidence presented by Kolling (Dow Jones & Co.’s distributor) was sufficient to support the jury’s finding that Dow Jones & Co. engaged in coercive vertical minimum resale price fixing in per se violation of the Cartwright Act. Given that the California vertical price restraints cases under the Cartwright Act are not only dated, but also, were expressly predicated upon now repudiated prior federal economic and jurisprudential assumptions – which today no longer apply per se treatment to vertical price fixing – it stands to reason that Mailand and its progeny must be viewed as outdated, and no longer have precedential value. Generally, “dual distribution” refers to a manufacturer’s or supplier’s decision to market goods using both independent distributors and its own distribution system in potential competition with its independent distributors. In dual distribution, a manufacturer simultaneously sells to independent distributors and to those who might otherwise be customers of those distributors. Typically, a manufacturer engaged in dual distribution will carefully delineate the customer classification or groups and the product and geographic markets for which the distributor will be responsible. The manufacturer’s own distribution system may involve direct selling or sales through the manufacturer’s company-owned subsidiaries or outlets. The California Supreme Court has not addressed vertical price fixing under the Cartwright Act since its decision in Mailand more than 35 years ago. Since then, there have been few California appellate court decisions addressing any type of price or non-price vertical restraints under the Cartwright Act. In stark contrast, during the past three decades, both the United States Supreme Court and a plethora of federal appellate and district courts have consistently vitiated the ancient “common law rule against restraints on alienation” approach to all vertical restraints – both price and non-price – under the Sherman Act. And, during that time, modern mainstream economic analysis evolved to the point where it now concludes that all vertical restraints, including price restraints, can have procompetitive effects on interbrand competition. At some point, then – and it already is beginning to happen – the California courts will be asked to address the question whether – in today’s economic world – there exists insufficient economic justification for the per se treatment of vertical price fixing under the Cartwright Act in light of the dramatic evolution of economic thought since 1978, when the Supreme Court decided Mailand. In Darush, a retailer of skin care products (Darush) sued a competing retailer (Lovely Skin) and their supplier (Revision), alleging that Revision stopped selling its skin care products to Darush because it refused to comply with Revision’s minimum resale price maintenance policy, following complaints by Lovely Skin about Darush’s price discounting practices.107 Darush’s complaint alleged that Revision and Lovely Skin conspired with each other to eliminate retailers of Revision, like Darush, who refused to participate in the price-fixing agreement, in per se violations of the Cartwright Act.108 Both defendants moved to dismiss. Thus, Guild and Mailand and its progeny are no longer viable authority because the mainstream of federal antitrust thought relied on in those California decisions has since changed course with the advent of the United States Supreme Court decisions in Kahn, Leegin and other federal circuit decisions. This suggests that inferior California state courts are not bound by the prior 30-33 year old California appellate and Supreme Court cases holding that: (a) vertical price fixing is per se unlawful under the Cartwright Act; and (b) dual distribution is always a per se horizontal violation of the Cartwright Act. And, following the interregnum in California, precipitated by the Leegin decision in 2007, the California Supreme Court may well conclude that the Cartwright Act does not compel continued adherence to the per se rule against vertical price restraints. Kaewsawang v. Sara Lee Fresh, Inc.
At the heart of Defendants’ demurrer are two purely legal questions in antitrust law. The first is whether vertical price fixing – also known as resale price maintenance – is (a) per se unlawful, or (b) subject to the rule of reason. The second is whether, in the context of a dual-distribution system, territorial restrictions imposed by a manufacturer on its distributors are (a) per se unlawful, or (b) subject to the rule of reason. …Plaintiffs argue that (1) [Mailand] is binding on this Court, (2) that the Cartwright Act is broader than the federal Sherman Act […], and (3) that interpretation of federal law are not conclusive… when construing the Cartwright Act […]. It seems fair to say that Mailand and Guild Wineries are no longer binding law in California. Still, it is an open question whether the California courts will accept – and find applicable to the Cartwright Act – the U.S. Supreme Court’s view that “[j]ust as the common law adapts to modern understanding and greater experience, so too does the ... prohibition on ‘restraints of trade’ evolve to meet the dynamics of present economic conditions.”162 And, if so, the question central to that discussion will be whether the California courts will accept the Supreme Court’s conclusion that the “economic literature is replete with procompetitive justifications for a manufacturer’s use of resale price maintenance.”163 What is entirely clear at this point is that the lower California courts are beginning to address all of this, and the California Supreme Court soon will be asked to decide the standard that today is applicable to vertical price fixing under the Cartwright Act. Morrison v. Viacom, Inc.,66 Cal. App. 4th 534, 541 (1998) (Cal. App. 1st Dist. 1998) (“Section 16727, added to the Cartwright Act in 1961, was patterned after section 3 of the federal Clayton Act, and cases interpreting Clayton Act section 3 are applicable when construing section 16727.”). Vinci v. Waste Management, Inc., 36 Cal. App. 4th 1811, 1817 (Cal. App. 1st Dist. 1995) (Because the Cartwright Act has objectives identical to the federal antitrust acts, the California courts look to cases construing the federal antitrust laws for guidance in interpreting the Cartwright Act.”). Aryeh v. Canon Business Solutions, Inc., 55 Cal. 4th 1185, 1195 (Cal. 2013) (“Interpretations of federal antitrust law are at most instructive, not conclusive, when construing the Cartwright Act, given that the Cartwright Act was modeled not on federal antitrust statutes but instead on statutes enacted by California's sister states around the turn of the 20th century.”). * James M. Mulcahy of Mulcahy LLP is a Certified Specialist in Franchise and Distribution Law in California. Mailand v. Burckle, 20 Cal. 2d 367 (Cal. 1978). See Fisher v. City of Berkeley, 37 Cal. 3d 644, 666 (Cal. 1984). Orchard Supply Hardware LLC v. Home Depot USA, Inc., 2013 U.S. Dist. LEXIS 53214 (N.D. Cal. 2013); Darush v. Revision, 2013 U.S. Dist. LEXIS 60084 (C.D. Cal. 2013); Kaewsawang v. Sara Lee Fresh, Inc., Superior Court of Calif., Case No. BC360109 (May 6, 2013). Cal. Bus. & Prof. Code §§ 16700-16770. Pac. Gas & Elect. Co. v. County of Stanislaus, 16 Cal. 4th 1143, 1147 (Cal. 1997). Kendall v. Visa U.S.A., Inc., 518 F.3d 1042, 1047 (9th Cir. 2008); see also Sidibe v. Sutter Health, 2013 U.S. Dist. LEXIS 78521 *28 (N.D. Cal. 2013); Dominick v. Collectors Universe, 2012 U.S. Dist. LEXIS 141950 *12 (C.D. Cal. 2012); GSI Technology, Inc. v. Cypress Semiconductor Corporation, 2012 U.S. Dist. LEXIS 93888 *8-9 (N.D. Cal. 2012). Cartwright Act §§ 16720(c) and (e)(2); Dominick, id. at *12. Smith v. State Farm Mut. Auto. Ins. Co., 93 Cal. App. 4th 700, 722 (Cal. App. 4th Dist. 2001); see also Marsh v. Anesthesia Services Medical Group, Inc., 200 Cal. App. 4th 480, 493 (Cal. App. 4th Dist. 2011). Knevelbaard Dairies v. Kraft Foods, Inc., 232 F.3d 979, 986 (9th Cir. 2000). Bus. Elecs. Corp. v. Sharp Elecs. Corp., 485 U.S. 717, 723 (1988). Texaco v. Dagher, 547 U.S. 1, 5, 6 (2006) (finding that although a joint venture between Shell Oil Co. and Texaco Inc. (“Equilon”) “may be price fixing in a literal sense, it [was] not price fixing in the antitrust sense.”). Kahn v. State Oil Co., 522 U.S. 3, 10 (internal quotation marks omitted) (1977); see also Broadcast Music, Inc. v. Columbia Broadcast Sys., 441 U.S. 1, 19-20 (1979) (Antitrust per se rules must be confined to practices that “always or almost always tend to restrict competition and decrease output.”); Cont’l T.V., Inc. v. GTE Sylvania Inc., 433 U.S. 36, 58-59 (1977) (“[D]eparture from the rule-of-reason must be based upon demonstrable economic effect rather than upon formalistic line drawing”); Krehl v. Baskin-Robbins Ice Cream Co., 664 F.2d 1348, 1356-57 (9th Cir. 1982) (“[M]odern economic thought indicates that the invalidation of a distribution system, absent a showing of anti-competitive effect, may actually retard competition. Competition is promoted when manufacturers are given wide latitude in establishing their method of distribution . . . .”) (internal quotation marks omitted). See Fisher v. City of Berkeley, 37 Cal. 3d 644, 668, 670-71 nn. 20-21 (Cal. 1984) (refusing to apply per se rule to new arrangement without benefit of evidence of economic consequences); Marsh, 200 Cal. App. 4th 480 at 495 (“[T]he prevailing standard is the ‘rule of reason’ which measures whether the anticompetitive aspect of a vertical restraint outweighs its procompetitive effects.”) (internal quotation marks omitted). Dr. Miles Med. Co. v. John D. Parker & Sons Co., 220 U.S. 373 (1911). Id. at 404 (internal quotation marks omitted). The Supreme Court overturned the Dr. Miles, id., decision in Leegin Creative Leather Products v. PSKS, Inc., 551 U.S. 877 (2007), holding that minimum resale price maintenance agreements would be analyzed pursuant to the rule of reason. Nevertheless, in 1919 – eight years after Dr. Miles – the Supreme Court made clear that a manufacturer may in fact lawfully seek to achieve this same result – i.e., retailer minimum resale price maintenance – by unilaterally establishing and announcing a suggested resale price, followed by the summary termination of any retailer who thereafter refuses to comply with that suggested price. United States v. Colgate & Co., 250 U.S. 300 (1919). California Courts, relying on federal Sherman Act precedent, have accepted the Colgate Doctrine as equally applicable to the Cartwright Act. See Kolling v. Dow Jones & Company, Inc., 137 Cal. App. 3d 709, 720 (Cal. App. 1st Dist. 1982) (“The Cartwright Act, like the Sherman Act, requires an illegal ‘combination’ or ‘conspiracy’ to restrain trade . . . [and] [u]nilateral refusal by a producer to deal with a distributor, absent proof that it was pursuant to an illegal conspiracy, does not violate the antitrust laws.”) (citations omitted); R.E. Spriggs Company, Inc. v. Adolph Coors Company, 94 Cal. App. 3d 419, 426 n. 4 (Cal. App. 2nd Dist. 1979) (“The parties as well as this court have proceeded on the assumption that federal cases interpreting the Sherman Act are applicable to problems arising under the Cartwright Act.”) (citations omitted); Chavez v. Whirlpool Corporation, 93 Cal. App. 4th 363, 366 (Cal. App. 2nd Dist. 2001) (“We conclude that the complaint fails to state a cause of action for violation of the Cartwright Act because the alleged conduct is permissible under the Colgate doctrine . . . and the facts pleaded are insufficient to establish a coerced agreement.”) (citation omitted). United States v. Arnold, Schwinn & Co., 388 U.S. 365, 379-380 (1967). Albrecht v. Herald Co., 390 U.S. 145 (1968). See Schwinn, 388 U.S. 365at 380; Albrecht, id., at 152. Cont’l T.V., Inc. v. GTE Sylvania Inc., 433 U.S. 36, 53 (1977). See generally Bus. Elects. Corp. v. Sharp Elecs. Corp., 485 U.S. 717 (1988). State Oil Co. v. Khan, 522 U.S. 3 (1997). Id. at 20. (Explaining that when the per se rule becomes economically unsound, “stare decisis is not an inexorable command.”). Leegin Creative Leather Products, Inc. v. PSKS, Inc., 551 U.S. 877, 882 (2007). Id. at 900. The Court did, however, identify four instances where the use of minimum resale price maintenance might have anticompetitive effects: (1) when used to “facilitate a manufacturer cartel;” (2) when used to “organize cartels at the retail level;” (3) when used by a dominant retailer “to forestall innovation in distribution that decreases costs;” and (4) when used by a manufacturer with market power to “give retailers an incentive not to sell the products of smaller rivals or new entrants.” Id. at 892-894. Id. at 900, 881, 902. (“Our continued limiting of the reach of the decision in Dr. Miles and our recent treatment of other vertical restraints justify the conclusion that Dr. Miles should not be retained.”). The Court, however, left it to the lower courts to establish a “litigation structure” to consider the effects of these restraints and “to ensure the rule operates to eliminate anticompetitive restraints from the market and to provide more guidance to businesses.” Id. at 898. Id. at 899; see also id. at 900 (“Likewise, the boundaries of the doctrine of per se illegality should not be unmovable. For it would make no sense to create out of the single term ‘restraint of trade’ a chronologically schizoid statute, in which a ‘rule of reason’ evolves with new circumstances and new wisdom, but a line of per se illegality remains forever fixed where it was.”). See Id. at 904. (“There is likewise little economic justification for the current differential treatment of vertical price and nonprice restraints. Furthermore, vertical nonprice restraints may prove less efficient for inducing desired services, and they reduce intrabrand competition more than vertical price restraints by eliminating both price and service competition.”); See also Monsanto Co. v. Spray-Rite Serv. Corp., 465 U.S. 752, 762 (1984) (in many cases, “the economic effect” of price and nonprice restrictions is “similar or identical.”). 20 Cal. 3d 367 (Cal. 1978). In Harris v. Capitol Records Distributing Corp., 64 Cal. 2d 454 (Cal. 1966), a case brought under the California Practices Act, Cal. Bus. & Prof. Code §§ 17031, 17040, the California Supreme Court also made the comment, in dicta, that “[i]ndeed, a vendor is generally prohibited by law from conditioning his sale to a vendee on an agreement by the latter to maintain a minimum resale price; to do so would violate the Sherman Act and the Cartwright Act….” Id. at 463. But, Harris is 47 years old, and relied upon outdated and now overturned federal precedent. In the context of current economic thought, the Court’s comment may be an intellectual obliquity. Mailand, 20 Cal. 3d 367at 371. Marin County Bd. Of Realtors, Inc. v. Palsson, 16 Cal. 3d 920, 925 (Cal. 1976), holding that cases interpreting the Sherman Act are applicable to the Cartwright Act. Palsson is no longer controlling, following the California Supreme Court’s decision in Cal. ex rel. Van de Kamp v. Texaco, Inc., 46 Cal. 3d 1147, 1164 (Cal. 1988), superseded by statute on other grounds. In Van de Kamp, the Court detailed the historical and textual analysis of the Cartwright Act and concluded that it was patterned after the 1889 Texas act and the 1899 Michigan act – not the Sherman Act. Id. at 1154-1164. This analysis led the Van de Kamp Court to conclude that its “derivation” of the Cartwright Act in Palsson “was not completely accurate,” and that judicial interpretation of the Sherman Act “is not probative on interpretation of the Cartwright Act.” Id. at 1164, 1165, 1168, 1169. Mailand, 20 Cal. 3d 367at 376. Id. (citing, inter alia, Dr. Miles and Albrecht). 94 Cal. App. 3d 419 (Cal. App. 2nd Dist. 1979). Copper Liquor Inc. v. Adolph Coors Co., 506 F.2d 934 (5th Cir. 1975); Adolph Coors Company v. F.T.C., 497 F.2d 1178 (10th Cir. 1974). Spriggs, 94 Cal. App. 3d 419 at 431. Id. at 426 n. 4. Id. (“The parties as well as this court have proceeded on the assumption that federal cases interpreting the Sherman Act are applicable to problems arising under the Cartwright Act.”) (citation and internal quote omitted). 137 Cal. App. 3d 709 (Cal. App. 1st Dist. 1982). Id. at 717. (“The Cartwright Act is patterned after the federal Sherman Antitrust Act, so that decisions under the latter act are applicable to the former.”) (citations omitted); Id. at 724. (“[T]he case will be quite rare in which a per se violation such as price fixing does not cause competitive injury.”) (internal quotation marks omitted). Id. at 722-723. (“Particularly persuasive in this respect is the case of Spriggs v. Adolph Coors Co. [citation omitted], where this court found evidence of price fixing by Coors in its dealings with beer distributors.”). 93 Cal. App. 4th 363 (Cal. App. 2nd Dist. 2001). Monsanto Co. v. Spray-Rite Service Corp., 465 U.S. 752 (1984). In Monsanto, the Supreme Court held that a manufacturer’s termination of one of its distributors in response to complaints from other distributors concerning the price discounting activities of the terminated distributor was not sufficient to infer a conspiracy to set resale prices in violation of the Sherman Act. Id. at 759, 763. Instead, there must exist additional evidence that “tends to exclude the possibility that the manufacturer and nonterminated distributors were acting independently” and that “reasonably tends to prove that the manufacturer and others had a conscious commitment to a common scheme designed to achieve an unlawful objective.” Id. at 764, 768. Chavez, 93 Cal. App. 4th 363at 373-374. Id. at 369. (“The similar language of [the Sherman Act and the Cartwright Act] reflects their common objective to protect and promote competition. Since the Cartwright Act and the federal Sherman Act share similar language and objectives, California courts often look to federal precedents under the Sherman Act for guidance.”) (citations omitted) (emphasis added). 110 Cal. App. 4th 242 (Cal. App. 2nd Dist. 2003). Id. The plaintiffs brought claims under California’s Unfair Practices Act (Bus. & Prof. Code § 17000 et seq. ), but on appeal, argued that were the Court to permit it, plaintiffs could amend their complaint to state a valid claim for vertical price fixing in per se violation of the Cartwright Act. It was in that context that the appellate court noted as an aside that the Cartwright Act prohibits vertical resale price maintenance. Id. at 263. 102 Cal. App. 3d 627 (Cal. App. 1st Dist. 1980). Id. Sosnick conceded that were the “rule of reason” made applicable to his claims, he could not prove any antitrust violation. Id. at 630. Guild Wineries did not involve any claim that there was a “concert of action among distributors, or an overt conspiracy between Guild and the several distributors, in order to establish a per se violation of the antitrust laws.” Id. at 636. Instead, Guild Wineries involved the alleged “coercive” conduct of Guild alone – i.e., termination of the Sosnick distributorship agreement – and in affirming the judgment below, the California appellate court made what in today’s evolved economic and antitrust jurisprudence would be an astonishing comment: “[i]f the arrangement or combination…is put together through the coercive tactics of the seller alone, this is sufficient” to find a horizontal per se violation of the Cartwright Act. Id. (quoting outdated federal antitrust case law) (internal quotation marks and citations omitted) (emphasis added). Id. (quoting the California Supreme Court in Chicago Title Ins. Co. v. Great Western Financial Corp., 69 Cal. 2d 305(1968)). Id. at 633-634 (relying upon American Motor Inns, Inc. v. Holiday Inns, Inc., 521 F. 2d 1230 (3rd Cir. 1975); Hobert Brothers Co. v. Malcolm T. Guilland, Inc., 471 F.2d 894 (5th Cir. 1973); Krehl v. Baskin-Robbins Ice Cream Co., 78 F.R.D. 108 (C.D. Cal. 1978)). Aside from the startling nature of the Guild Wineries holding in the context of current economic jurisprudence, even in the 1980’s, it was questionable whether Guild Wineries’ analysis authoritatively represented the proper antitrust approach to dual distribution issues. See Dimidowich v. Bell & Howell, 803 F.2d 1473 (9th Cir. 1986). 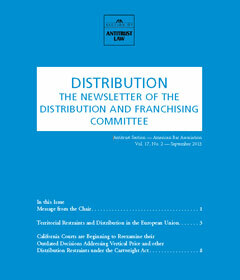 In Dimidowich, the Ninth Circuit held, in the context of a similar, but “hybrid” dual distribution arrangement, that “the [Guild Wineries]analysis [was] flawed” because “[a]lthough a manufacturer’s relationship with its distributors has a horizontal aspect when it acts as a distributor itself, it remains primarily a vertical relationship.” Because Guild Wineries “ignore[d] the possible benefits to interbrand competition that can result from allowing restrictions in the interbrand market,” the Ninth Circuit was “convinced [that] the California Supreme Court…would analyze both dual distribution and [the “hybrid” dual distribution arrangement addressed in Dimidowich] under the rule of reason.” Id. at 1481-1483. For example, recently, the Fifth Circuit outright rejected a dealer’s claim that because the manufacturer was a dual distributor, operating both as a manufacturer and retailer in competition with its dealer, its pricing policy was a horizontal restraint in per se violation of the Sherman Act. See PSKS, Inc. v. Leegin Creative Leather Products, Inc., 615 F.3d 412, 420-421 (5th Cir. 2010). Both the Fifth Circuit and the district court below noted that, in addition to the Fifth Circuit, at least eight other federal circuits have applied the traditional rule of reason to dual distribution systems. Id. at 421 n.8 (2d Cir; 3d Cir; 4th Cir; 6th Cir; 7th Cir; 8th Cir; 9th Cir; and 10th Cir. )(citations omitted). See also ABA Section of Antitrust Law, Antitrust Law Development at 163 (7th ed. 2012) (explaining that “every decision since [Sylvania (1977)] has analyzed restraints imposed by a manufacturer that competes with its distributors under the rule of reason”). See Nynex Corporation v. Discon, Inc., 525 U.S. 128 (1998). Id. at *17-18. (referring the district court to Redwood Theatres, Inc. v. Festival Enters., Inc., 200 Cal. App. 3d 687, 699 (Cal. App. 1st Dist. 1988); and Bert G. Gianelli Distrib. Co. v. Beck & Co., 172 Cal. App. 3d 1020, 1044 (Cal. 2006). 2013 U.S. Dist. LEXIS 60084 (C.D. Cal. 2013). See Id. at *17 (citations omitted). Id. at *16. (citing Dimidowich, 803 F. 2d 1473 at 1477, “The California Supreme Court has said that the Cartwright Act is similar in spirit and substance to the Sherman Act, but similar does not mean identical.”) (internal quotations and citations omitted). Id.at *16-17. (citations omitted). The “some indication that [the Mailand] opinion was derived from California authority as well” refers to the 67 year old California Supreme Court opinion in Speegle v. Board of Fire Underwriters, 29 Cal. 2d 34 (Cal. 1946). In Speegle (called into doubt by statute as stated in Manufacturers Life Inc. Co. v. Superior Court, 10 Cal. 4th 257, 279 (Cal. 1995)), the plaintiff, an insurance agent, had written agency contracts with defendants, an association of fire insurances and its members. Id. at 37. In early 1939, the defendants accused the plaintiff of violating his agency contracts by placing insurance with non-board members and, as a result, terminated the contracts. Id. The question presented to the Speegle court was whether the plaintiff stated a valid claim under the Cartwright Act – i.e. whether the application of the Cartwright Act to the business of insurance was unconstitutional. Id. at 38. The defendants asserted that the state statute was an unconstitutional regulation of interstate commerce. The Speegle court upheld the constitutionality of the Cartwright Act, finding it to be an implementation of the common law prohibition against combinations in restraint of trade, and held that it was applicable to the business of insurance. Id. at 42. In its underlying analysis, the Speegle court commented, in dicta, that “[t]he Cartwright Act merely articulates in greater detail a public policy against restraint of trade that has long been recognized at common law. Thus, under the common law of this state combinations entered into for the purpose of restraining competition and fixing prices are unlawful.” (internal citations omitted). Id. at 44. Although the Speegle court’s analysis generally described the public interest behind the Cartwright Act, it never addressed the issues in Mailand (e.g., resale price maintenance). And, of course, Mailand was decided 32 years after Speegle. Federal case law interpreting the Sherman Act is the only real source of authority underlying the Mailand court’s decision. Because federal case law now is otherwise, Mailand has no precedential value. 2013 U.S. Dist. LEXIS 60084 at *17. 140 Cal. App. 4th 1120, 1123 (Cal. App. 4th Dist. 2006). 27 Cal. 287 (Cal. 1865) (holding that when a trial court judgment decides a case on two alternative grounds, but the appellate court affirms on the first ground only, the judgment nevertheless is binding on principles of res judicata on both grounds, even though the appellate court did not address the second ground). Newport Beach Country Club, 140 Cal. App. 4th 1120at 1129, 1131 (citations omitted). Id. at 1132 (quoting Justice Holmes). 22 Cal. App. 4th 1273 (Cal. App. 2nd Dist. 1994). Bos. Material Handling, Inc. v. Crown Controls Corp., 137 Cal. App. 3d 99. Crown Homes, 22 Cal. App. 4th 1273at 1276. See California v. Bioelements, Inc., 2011-1 Trade Cases (CCH) ¶ 77,306 (Sup. Ct. Riverside Cty. Jan. 11, 2011). (cosmetics company agreed to settle a complaint brought by State of California, alleging that it engaged in vertical price fixing in per se violation of the Cartwright Act by entering into dozens of contracts with other companies requiring them to sell the company’s online products at prescribed prices); California v. Derma Quest, Inc., 2010-1 Trade Cas. (CCH) ¶ 76,922 (Sup. Ct. Ala. Cty. Feb. 23, 2010). (cosmetics company agreed to terms of consent decree to settle a civil suit brought by the State of California alleging that it entered into distribution agreements with resale price maintenance components in per se violation of the Cartwright Act). Both Bioelements and Derma Quest were resolved by way of voluntary consent decrees. The California courts have not validated – indeed, have not been asked to address – the California Attorney General’s position since Leegin was decided by the U.S. Supreme Court in 2007. See generally, Antitrust and Unfair Competition Law Section, The State Bar of California, California State Antitrust and Unfair Competition Law, Revised Edition, Ch. 1 (Cheryl Lee Johnson, ed., Matthew Bender & Co., 2012); see also Cal. ex rel. Van de Kamp v. Texaco Inc., 460 Cal. 3d 1147, 1164 (Cal. 1988) (“Historical and textual analysis reveals that the [Cartwright] Act was patterned after the 1889 Texas act and the 1899 Michigan Act, and not the Sherman Act. [ . . . . ] Hence judicial interpretation of the Sherman Act, while helpful, is not directly probative of the Cartwright drafter’s intent, given the different genesis of the provision under review.”); Aryeh v. Canon Business Solutions, Inc., 55 Cal. 4th 1185, 1195 (Cal. 2013) (“We have observed that the Cartwright Act is broader in range and deeper in reach than the Sherman Act . . . .”). See Van de Kamp, 460 Cal. 3d 1147at 1164. (Recognizing that the Attorney General relied upon “authorities stating that the Cartwright Act is modeled after the Sherman Act” in support of the position of the State of California). See, Appendix to this article. See Fisher v. City of Berkeley, 37 Cal. 3d 644, 670 (Cal. 1984). See Mailand, 20 Cal. 3d 367 at 377. See, Fisher, 37 Cal. 3d 644 at 666-667. (citations omitted). Kaewsawang v. Sara Lee Fresh, Inc., Superior Court of Calif., Case No. BC360109 (May 6, 2013). On October 10, 2006, plaintiff Rodney Kaewsawang, a distributor of Sara Lee products pursuant to a written franchise agreement, filed a lawsuit against Sara Lee Corporation and its wholly-owned subsidiary, Sara Lee Fresh, Inc. (Sara Lee), alleging that he and other distributors had been misclassified as independent contractors, rather than employees in violation of various provisions of the California Labor Code (the Employee Misclassification Claims). Sara Lee filed an answer to the Employee Misclassification Claims, which denied the allegations. In his First Amended Complaint (October 23, 2006), Kaewsawang alternatively alleged that, in the event that he and other distributors were found not to be Sara Lee’s employees, Sara Lee was guilty of having violated the Cartwright Act by imposing unlawful vertical price restraints upon the distributors’ resale of Sara Lee products to various retail stores. In his Second Amended Complaint (May 15, 2008), Kaewsawang added Eddie Alsheikh, as a named plaintiff and putative class representative for the Employee Misclassification Claims. In February, 2011, Sara Lee defeated class certification on the Employee Misclassification Claims and, on May 3, 2012, the California Court of Appeal upheld the denial of certification. Kaewsawang v. Sara Lee Fresh, Inc., 2012 Cal. App. Unpub. LEXIS 3386 (Cal. App. 2nd Dist. 2012). At that point, on September 27, 2012, plaintiffs added Sylvia Ingoglia as a named plaintiff and putative class representative for the alternative antitrust claims under the Cartwright Act. Plaintiffs also added Bimbo Bakeries USA, Inc. and Earthgrains Distribution, LLC as additional Defendants under a successor in interest theory of liability (together with Sara Lee, collectively referred to as the Sara Lee Defendants). On October 22, 2012, the Sara Lee Defendants filed a demurrer to the plaintiffs’ Cartwright Act claims. On December 10, 2012, the trial court sustained the demurrer with leave to amend. On January 11, 2013, plaintiffs filed their Fourth Amended Complaint (the FAC), which is the subject of this article. Kaewsawang Case NO. BC360109 (May 16, 2013) FAC at ¶ 27, 31. Id. at ¶ 43, 66-70. Id. at ¶ 73. Rather than sell the Sara Lee Baked Goods to the plaintiffs – i.e., transfer title to them – and allow the plaintiffs to resell to the Chain Stores, the Sara Lee Defendants might simply have retained the plaintiffs as commissioned sales agents to perform the delivery and service fulfillment functions that were set forth in their franchise agreements. See e.g., Gentis v. Safeguard Gus. Sys., 60 Cal. App. 4th 1294 (Cal. App. 2d Dist. 1998) (franchisees were commissioned sales agents who solicited orders, followed leads and provided customer service, but never bought inventory or took title to any goods). This would have obviated any potential vertical price fixing claim in the first instance. See United States v. General Electric, 272 U.S. 476 (1926) (holding that the per se rule against resale price maintenance does not apply to agency relationships or where a good is sold on consignment). The plaintiffs described the agreements between the Sara Lee Defendants and the Chain Stores as “slotting fee agreements, authorization agreements and/or Customer Marketing Agreements whereby [the Sara Lee Defendants] committed to deliver [the Sara Lee Baked Goods] and the Chain Stores agreed to provide shelf space and displays . . . .” Kaewsawang Case No. BC360109 (May 16, 2013) FAC at ¶ 33. Thus, according to plaintiffs, the Sara Lee Defendants acted as the “category manager” or “category captain,” for the Chain Stores, and was responsible for “setting the schematics for all products (i.e., both Defendants’ products and competitors’ products) in a particular area in the Chain Stores.” Id. at ¶ 46. Id. at 34, 44. Competition for distribution often involves contracting activity regarding the retailer’s decision to carry, promote or place a particular product. This process includes business practices such as manufacturer payments to retailers for floor space in the form of wholesale price discounts, slotting allowances, market share discounts and bundled rebates, coupled with category management. These arrangements are “commonplace among retailers of a wide variety of products.” See Church & Dwight Co., Inc., v. Mayer Laboratories, Inc., 2011 U.S. Dist. LEXIS 35969 (N.D. Cal. 2011) *49-50; see also El Aguita Food Prods., Inc., v. Gruma Corp., 301 F. Supp. 2d 612, 620 (S.D. Tex. 2003) (“It is well known that the retailers and manufacturers engage in negotiations that result in the payment of slotting promotionals, co-op advertising, and other allowances or discounts that favor the retailers.”). Slotting allowances and analogous payments for promotional displays require the manufacturer to pay the retailer up front for space time per unit, rather than for each unit that the retailer sells. Bundled rebates are another form of manufacturer payment to retailers for distribution. They are characterized by retailer discounts from the manufacturer that increase when the retailer also purchases the manufacturer’s products in other markets. A category management arrangement is a business practice by which a retailer plans its strategy on a product category rather than on a brand-by-brand basis. Products are grouped into commonly understood categories and the retailer selects a specific manufacturer to act as the “Category Captain,” sometimes in return for a cash payment to the retailer for this privilege. The Category Captain then performs category retail management tasks not only for its own brands, but also for those of competing manufacturers. Such category management tasks include choosing the most appropriate assortment, placement, pricing and promotion of products carried at the retail store level. The practice allows a single manufacturer to control decisions of an entire product category within a given retail chain. These arrangements are generally analyzed under the “rule of reason” framework, assessing whether the defendant has market power – i.e., the ability to restrict output and maintain or raise prices – and whether the challenged conduct forecloses competition in a substantial share of the line of commerce involved, and whether there is likely to be competitive harm. See Church & Dwight Co., Inc. at *37-38. 20 Cal. 3d 367, 377 (Cal. 1978). Kaewsawang Case No. BC360109 (May 16, 2013) FAC at ¶ 78. According to the plaintiffs, this vertical price restraint resulted in the maintenance of prices charged by the independent distributors at “supra-competitive levels, which adversely impacts the price ultimately paid by the consumer.” Id. at ¶ 79. These allegations compel two observations: first, it is not “plausible on its face,” (See Bell Atlantic Corp. v. Twombly, 550 U.S. 544, 570 (2007)), that the Sara Lee Defendants’ negotiation of price and non-price sales terms with the Chain Stores in a competitive interbrand market – on behalf of the independent distributors, who voluntarily delegated that function to the Sara Lee Defendants by contractual agreement – can constitute unlawful “price-fixing” in the first instance. And, second, it is similarly implausible and counterintuitive to suggest that the negotiated terms of purchase can result in “supra-competitive” price levels. Kaewsawang Case No. BC360109 (May 16, 2013) FAC at ¶ 37. Id. at ¶ 83. The plaintiffs also alleged that, “by dividing customers and territories between its own employee-distributors on the one hand, and plaintiffs and [putative] Class members, on the other, the price at which the [Sara Lee] [B]aked [G]oods are sold to retail stores can be maintained at supra-competitive levels, which adversely impacts the price ultimately paid by the consumer.” Id. at ¶ 85. However, in response, two points are appropriate: First, the plaintiffs’ allegations suggest nothing more than that the vertical non-price restraint has effects on intrabrand competition – but, “[v]ertical restrictions promote interbrand competition by allowing the manufacturers to achieve certain efficiencies in the distribution of products. These ‘redeeming virtues’ are implicit in every decision sustaining vertical restrictions under the rule of reason.” Bert G. Gianelli Distributing Co. v. Beck & Co., 172 Cal. App. 3d 1020, 1048 n. 9 (Cal. App. 1st Dist. 1985), disapproved on other grounds in Dore v. Arnold Worldwide, Inc., 39 Cal. 4th 384, 394 (Cal. 2006) (citations omitted) (emphasis added). Second, in point of fact, because the plaintiffs designated the Sara Lee Defendants as their “agent” to negotiate their price and non-price terms of sale to the Chain Stores when they voluntarily entered into the franchise agreements, the territorial and customer restrictions could not have an effect on intrabrand competition either, as alleged by plaintiffs. Essentially, the plaintiffs’ claim was nothing more than contractual – i.e., their real complaint was that they were dissatisfied with the “agency” term of their franchise agreements. See Guild Wineries and Distilleries v. J. Sosnick & Son, 102 Cal. App. 3d 627, 633 (Cal. App. 1st Dist. 1980). Sara Lee Defendants’ Memorandum in Support of Demurrer to the FAC at 7, Kaewsawang Case No. BC360109 (May 16, 2013). Id. at 9. As the Sara Lee Defendants correctly explained, “[t]o the contrary, virtually every decision since Sylvania has analyzed restraints imposed by a manufacturer that competes with its distributors under the rule of reason.” (citing ABA Section of Antitrust Law, Antitrust Law Development at 163 (7th ed. 2012)). (internal quote omitted). See Texaco, Inc. v. Dagher, 547 U.S. 1, 4 (2006). See Oracle America, Inc. v. Cedarcrestone, Inc., 2013 U.S. Dist. LEXIS 48538 *18 (N.D. Cal. 2013) (quoting Newcal Indus., Inc. v. Ikon Office Solutions, 513 F.3d 1038, 1044 (9th Cir. 2008)). Sara Lee Defendants’ Memorandum in Support of Demurrer to the FAC at 10-12, Kaewsawang Case No. BC360109 (May 16, 2013) (citing Tominaga v. Sheperd, 682 F. Supp. 1489, 1494 (C.D. Cal. 1988); Mozart Co. v. Mercedes-Benz of North America, Inc., 833 F.2d 1342, 1346-47 (C.D. Cal. 1987); Exxon Corp. v. Superior Court, 51 Cal. App. 4th 1672, 1681, 1686 (Cal. App. 6th 1997); and, naturally, the ubiquitous (in franchise antitrust cases) Queen City Pizza, Inc. v. Domino’s Pizza, Inc., 124 F.3d 430, 440-41 (3rd Cir. 1997)). The Sara Lee Defendants also argued – successfully – that the plaintiffs failed to allege any plausible “antitrust injury” resulting from “the [alleged anticompetitive aspects or effects of [the Sara Lee Defendants’] conduct, as opposed to injury resulting from neutral or even procompetitive aspects.” Sara Lee Defendants’ Memorandum in Support of Demurrer to the FAC at 5, Kaewsawang Case No. BC360109 (May 16, 2013) (citing Flagship Theaters of Palm Desert, LLC v. Century Theatres, Inc., 198 Cal. App. 4th 1366, 1380 (Cal. App. 2d Dist. 2011)). Plaintiffs’ Memorandum in Opposition to the Sara Lee Defendants’ Demurrer, at 1 [internal citations omitted], Kaewsawang Case No. BC360109 (May 16, 2013). At the outset, the Court quickly decided that Kaewsawang’s “price fixing” allegations did not constitute “price fixing” in the antitrust sense at all. Court’s Ruling on Submitted Matter Re Demurrer at 7, Kaewsawang Case No. BC360109 (May 16, 2013). This is intuitive “because the prices are ’negotiated’” and “it is unclear how Defendant and the Chain Stores conspired to engage in price fixing.” Id. (“Thus it would appear that, in this case, the market sets the relevant prices” and that “the prices have been determined ‘by the interplay of the economic force of supply and demand.’”) Id. The court could have relied on this alone as justification for dismissing Kaewsawang’s price fixing and dual distribution antitrust claims, but went on to directly confront the Mailand and Guild Wineries issues. Id. at 8-9 (internal citations omitted). The Court also quickly disposed of Kaewsawang’svertical price restraints claim under the rule of reason, citing the Third Circuit’s decision in Queen City. (“Plaintiffs still have not defined the relevant market nor have they alleged that [the Sara Lee Defendants have] ‘market power’” because the “relationship …, is entirely based on the contractual distribution agreement between the parties….”) Id. at 10. Id. at 13 (citing Kolling). Id. The Court also recognized that theplaintiffs did not even allege any “dual distribution” arrangement at all, given that the franchise agreement demonstrated that the parties were operating in separate and distinct (mutually exclusive) geographic territories. Thus, the Sara Lee Defendants were not operating in competition with the plaintiffs at the same distributional level. Id. And, because they failed to allege any cognizable “relevant market,” their dual distribution antitrust claim could not, in any event, state a cause of action under the rule of reason. Id. at 10. Id. at 16. The Court also dismissed the Unfair Competition Law Claim (Bus. & Prof. Code §§ 17200, et al.) because the underlying antitrust claims – constituting the alleged wrongful act – had been dismissed. Id. The Sara Lee Defendants still must defend Kaewsawang’s individual Employee Misclassification Claims. Recently, employee misclassification claims in the franchise context have been proliferous. See e.g., Awuah v. Coverall North America, Inc., 707 F. Supp. 80 (D. Mass. 2010); De Giovanni, et al. v. Jani-King Int’l, Inc., et al., No. 07-10066-MLW (D. Mass. 2012); Teng Moua v. Jani-King of Minn., Inc., 2011 U.S. Dist. LEXIS 104026 (D. Minn. 2011); Myers v. Jani-King of Phila., Inc., 2009 U.S. Dist. LEXIS 68192 (E.D. Pa. 2009); Juarez v. Jani-King of Cal., Inc., 2012 U.S. Dist. LEXIS 19766 (N.D. Cal. 2012). Terrelle Ford v. Palmden Rests., 2012 Cal. App. Unpub. LEXIS 5596 (Cal. App. 4th Dist. July 31, 2012). Patterson v. Domino’s Pizza, LLC, 2012 Cal. LEXIS 9596, 1 (Cal. Oct. 10, 2012). Leegin, 551 U.S. 877 at 899. Id. at 889; see also Id. at 882 (“Respected economic analyst, furthermore, conclude that vertical price restraints can have procompetitive effects.”).